Young chemists love to make things happen and what better way than through physical changes and chemical reactions! Let’s get started! A physical change is any change to a substance that does not alter its chemical composition. An example of a physical change is a state change - when matter changes from a solid to liquid, or liquid to gas, or vice versa. This is a physical change because the substance stays the same, it is just in a different form. In other words, ice, water, and steam are all H2O, just in different forms. Another kind of physical change is a mixture. A mixture is when you combine two or more substances that do not react with each other chemically - they do not change their chemical structure. The substances combined each retain their own identity. Salt water is one example where it is easy to see that two substances are mixed together but do not change their identities. Try mixing 1/2 tsp of salt in a cup full of water, and 1/2 tsp of sugar in another cup of water. What happens to the sugar and salt? Can you still see it? Is it still there? Try tasting the solutions. Can you tell that the sugar and salt are still there? Is there any way to get the sugar or salt out of the water again? How? Try boiling the the salt water in a pot until the water is all gone. What happened? The salt is still there! That is because in the solution, the water remained water and the salt remained salt, they were simply mixed together. That is a physical change. A chemical reaction, also called a chemical change, is when matter changes chemically and a new substance is formed. The atoms or molecules in the matter are rearranging to create something different from what was originally present. Usually this change is not reversible and usually there is evidence of a chemical change in the form of heat, light, fire, bubbling, odor, a color change, formation of a gas, or formation of a solid. Let’s take a closer look. Light a candle. What do you observe? What kind of a change is taking place? If you guessed a chemical or physical change, you are right! Both changes are taking place. The wax on the candle is melting, which is a physical change. There is also fire, light, heat, and an odor, which are clues that a chemical change is taking place. This is a simple experiment, but it is a really fun one too! 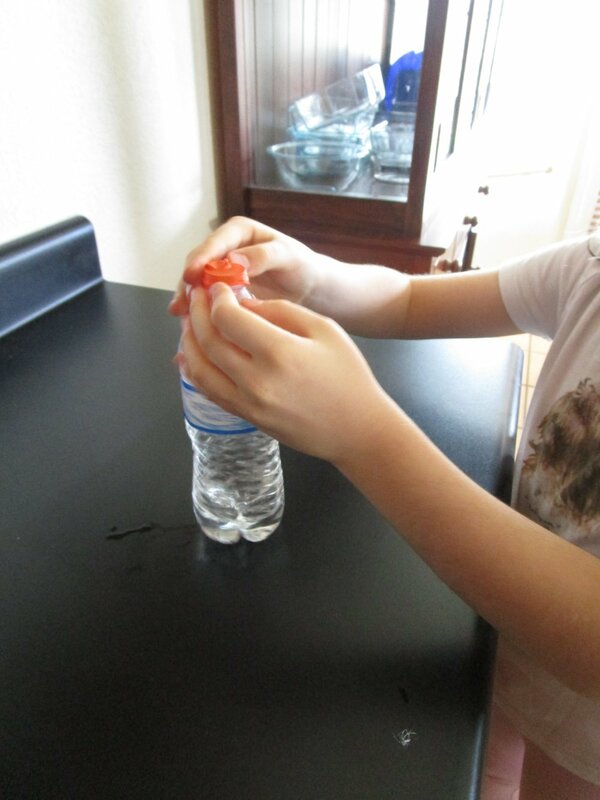 Put the funnel in the end of the balloon and carefully pour the baking soda in. Pour the vinegar into the bottle. Take the balloon and pick the end so the baking soda stays in the bottom of the balloon. Carefully stretch the balloon over the opening of the bottle, being careful not to let the baking soda fall in. Now, hold the balloon up and let the baking soda fall in. Watch what happens! The balloon quickly inflates. Why? The vinegar and baking soda created a chemical reaction! The chemical reaction produced carbon dioxide gas which inflated the balloon. So we see how a chemical reaction can form a gas. Scoop a small amount of cornstarch onto a paper plate. Mix a few drops of iodine in a cup of water. Now, use your pipette or eye dropper to drop a drop or two of your iodine solution onto the cornstarch. What happens? It turns dark purple or blue! How does that happen? It is a chemical reaction between the iodine and starch molecules. Now, scoop a little of the starch into your cup of iodine solution. Did it turn a dark color? If not, add some more starch. When your solution is dark, drop a few drops of your vitamin C solution into the cup. What happened? It turned light again! This is another chemical reaction. The vitamin C, or ascorbic acid, reduces the iodine to iodide so the starch returns to its normal color. -Stir until fully mixed, then when you can no longer stir it, take it out and form a bouncy ball. Try bouncing it on the floor. You have formed a solid through a chemical reaction between glue and borax! Keep your new bouncy ball in a plastic bag until you are ready to play with it again. Which one was a chemical change? In some reactions, it can be hard to tell if a physical change or a chemical change has taken place because they can look a lot alike. In this activity, we will compare two similar reactions and see if we can figure out which one is a chemical change. Open the roll of mentos and glue each individual mint together with hot glue into one tall tower. Set the soda and Mentos tower aside while you prepare the second reaction. Pour 1/2 c. hydrogen peroxide into the empty bottle. Add a squirt or two of dish soap and swirl the bottle to mix it into the hydrogen peroxide. In a cup, mix 1/4 cup of very warm water and the package of yeast. Now that both reactions are prepared, take your bottles, Mentos, and cup of yeast outside or to another place that’s easy to clean - this will make a mess! Now, put your Mentos tower in the soda bottle and watch what happens. When it stops bubbling, pour your cup of yeast into the bottle of hydrogen peroxide and dish soap. What happens? Check both reactions for signs of a chemical reaction. What did you observe? Make sure to get a good look at, smell, touch each substance that comes out of the bottles. While both reactions bubble and almost explode in a similar way, only the elephant toothpaste is a chemical reaction. How can you tell? It created heat! While the soda and Mentos appeared to create a gas, the Mentos were really only helping the carbon dioxide already in the soda to escape, much like when you shake a can of soda and then open it. In chemistry, we often talk about the pH of various substances, but what exactly does that mean? Let’s find out! pH stands for potential for hydrogen. Look at hydrogen on the periodic table. How many protons does it have? How many electrons? Look at a diagram of hydrogen. What do you remember about what atoms like to do with their orbitals? They like to fill the outer ones (called valence shells) up or empty them. Since hydrogen only has one electron, it is a pretty reactive atom! It likes to give an electron or get one, and thereby bond with many different atoms. Potential for hydrogen, or pH, refers to what is happening to hydrogen in a compound. The pH scale is a scale from 0-14. 7 on the pH scale is neutral. Water has a pH of 7. Anything lower than 7 is acidic - the acidity gets higher as the number gets lower. Anything greater than 7 is a base or alkaline and its alkalinity gets higher as the numbers get higher. Acids like to give away hydrogen ions. They are sour and they react with metals, so they are corrosive. Acids can also be damaging to living tissue. Bases like to collect hydrogen ions. They are bitter and slippery. They are good at dissolving fats. Because of this, most soaps are basic. A strong base can also be damaging to living tissue. Let’s do an activity to become familiar with the pH of everyday substances. Number 8-10 small plastic cups. Gather an assortment of acidic and basic liquids. Some liquids you might use are: tomato juice, soda, orange juice, baking soda water, lemon juice, vinegar, milk of magnesia, dish soap (thin it slightly with water), hand soap (thin it slightly with water), and glass cleaner. Make sure to include water in your assortment. Fill each cup halfway with one of the liquids. Be sure to keep a numbered list so that you know what liquid is in which cup. Have the children test the pH of each liquid with the end of a litmus strip. Compare the color on the strip to the pH scale that comes with your litmus strips. Which of the liquids is the most acidic? Which is the most basic? Can you guess what each of the liquids is? Have the children record their results!